Deciding to have a baby is an exciting thing. When you are trying to conceive, it is important to remember that you may become pregnant and not know for a bit, so adequate intakes of vitamins and nutrients are important prior to conception as well as during pregnancy. Before taking any supplements or prenatal vitamins, talk with your obstetrician about recommended dosages and whether it is safe for you to take certain supplements when trying to conceive. Folic acid is the synthetic form of folate, a B-vitamin that naturally occurs in food. According to the National Institutes of Health Office of Dietary Supplements, folate helps form and maintain new cells and is necessary to make DNA and RNA. 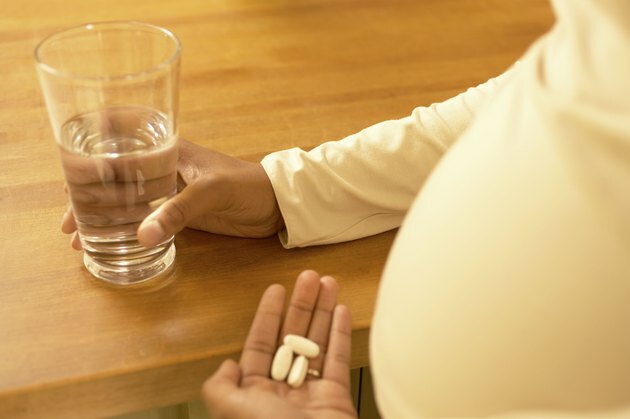 This is important during the early stages of pregnancy, because a deficiency of folic acid can lead to neural tube defects, which include malformation of the spine, skull and brain, says the Office of Dietary Supplements. Adequate intakes of folic acid right before and right after conception can help reduce the risk of these defects. The recommended intake is 400 micrograms of folic acid for women who are planning on becoming pregnant or women who are pregnant. Getting enough calcium is important, but even more so if you are trying to get pregnant. If you do get pregnant and you are not consuming enough calcium, the baby will take the calcium it needs for its bones from your calcium stores, weakening your bones and increasing your risk for osteoporosis later on, says the March of Dimes. Although the recommended amount of calcium does not change if you are pregnant or not, many women do not get enough calcium in general. The March of Dimes says that most women consume approximately 700 milligrams of calcium daily, while women ages 19 to 50 need 1,000 milligrams each day for healthy bones. Iron is essential to good health, and women of childbearing age and women who are pregnant are at risk for developing iron-deficiency anemia due to the amount of iron they need, says the Office of Dietary Supplements. Iron helps transport oxygen throughout the body, and without enough iron, cells do not get enough oxygen, leading to fatigue, poor performance and an impaired immune system. The Office of Dietary Supplements recommends that women 19 to 50 years old should have a daily iron intake of 18 milligrams, and pregnant women should consume 27 milligrams per day of iron. Some women take prenatal vitamins when trying to conceive because you may be pregnant and not know it, and that is when your developing embryo needs nutrients like folic acid the most. The Cleveland Clinic describes prenatal vitamins as specially formulated vitamins that aim to fill in any nutritional gaps in your diet. These vitamins usually have higher levels of folic acid, iron and calcium for healthy development. It is important not to rely on a prenatal vitamin as your sole source of calcium, since it does not provide the recommended daily amount. Talk to your obstetrician before using prenatal vitamins while you try to conceive. Does It Hurt the Baby If I Don't Take Prenatal Vitamins? Can You Take Folic Acid & Iron at the Same Time? When Do I Stop Taking Prenatal Vitamins?